After meeting Gregg (of Comic Garbage again), we ventured over to the Artist Alley section of the DFF areas. It had a much lower ceiling than the Comic Book section and I think that made it feel a bit more crowded. It also didn’t help that every table in the place had artists and their work packed in there from start to finish. It wasn’t exactly claustrophobic, but didn’t exactly allow people with backpacks full of books to easily maneuver down the aisles. well blended image of the heavy hitting Asgardian. The artist had other ones from the cinematic universe: Iron Man, Captain America, and the Hulk, but something about this Thor one stuck out and demanded I take it home. 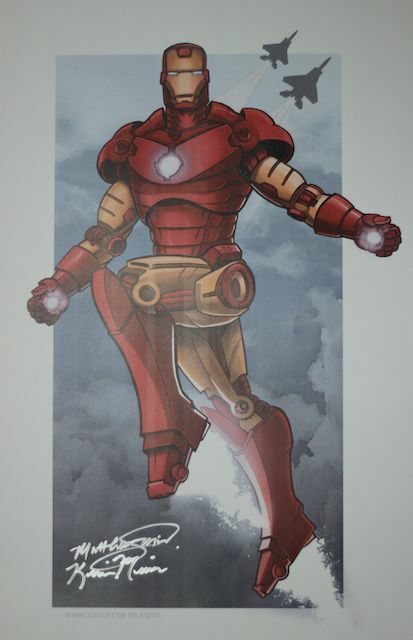 Once purchased, the artist gladly signed it for me and I honestly can’t wait to put it up at work. Mostly to combat the Spider-Fan a few spaces over, but I hope it starts a few conversations as The Dark World hits theaters. From here, the group got a bit scattered as we each talked to different artists at different booths. Brian and Gregg ran into a few web comic makers, brothers it seemed, who post a full comic book online in strips during their free time. It was well drawn and highly detailed, but Brian and Gregg delved deeper into the production aspect of the series rather than the actual comic itself. I find learning from those already in the trade is an invaluable benefit of attending conventions. The shared knowledge of both failures and successes can help everyone as we progress forward. I purchased a few small cards and a sticker, which aren’t as displayable as poster artwork, seem to be just as fun to take home. 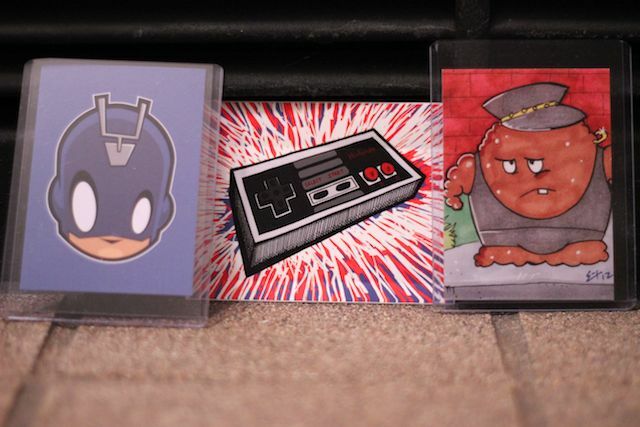 They consisted of a hand drawn Meatwad in his (not) bicurious outfit from Frat Aliens, a digitally illustrated Black Bolt bust, in which I already own a Sentry version (possibly more), and the sticker was an original Nintendo console in a pop art style. When reaching the deepest, darkest corner of the room, we were summoned by a younger looking fellow, but perhaps twice my build. He was giving us a pitch about being a self published comic book and being only 14 YEARS OLD. Dang. That was impressive and I looked into his hand drawn book, which again appeared to have been created during math class. A single two page spread that made me chuckle, despite the fact the main character murdered a mugger, led me to purchase the young man’s work for $4. As he literally slammed his plastic cash register in excitement and the ‘ching’ ringed through the area, I found myself either single handedly making that kid’s day worthwhile…or saving everyone from an impending meltdown this kid might have. Even had the kid sign it, it was pretty cool to support the underdog at a comic con. 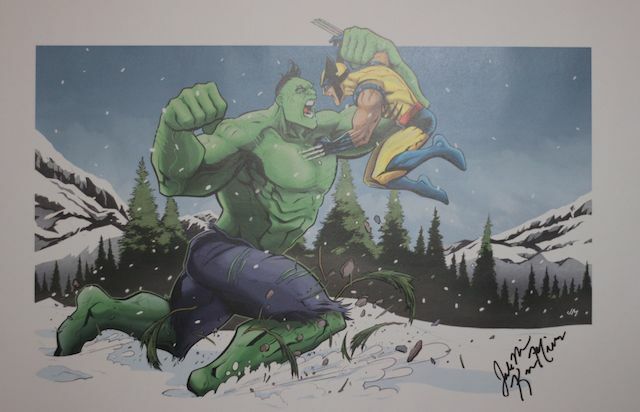 Before I left, I couldn’t leave with only one poster, so I found some guys who had digitally created a few comic book characters (Wolverine/Hulk and Iron Man). Come to find out, these were the web comic guys Brian and Gregg had been conversing with earlier. They sold their prints 2 for $5 and that made my day to support them just printing off copies of work they did digitally. I can’t wait to show those off too, bring a little bit of variety in comparison to Spider-Fan’s cube. If you have any suggestions on how I can Make Mine Marvel, I could use all the decorating help in the world. At the end of the day, Artist Alley is one of my favorite places to meet people who are fueling the comics industry. You can meet the next Ryan Stegman or Paolo Rivera there and not know it, but most of all, any purchases you make are fueling the dreams of someone else. I always feel like we’ve done a good deed when we leave with our hands full of non-book related artwork.